Country Boys Food Inc. are part of the Red Hook Food Vendors based in Brooklyn, New York. We are a family owned business that found its beginnings at Red Hook Park way back in 1993, serving up traditional authentic Mexican foods. Receiving many great recognitions and awards, we take pride in staying true to what we are and where we started. Serving great food at a great price, to great people. 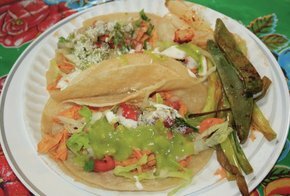 One order consists of two tacos (each with two corn tortillas) with your choice of meat(s) and/or vegetable(s). Plus your choice of toppings. One order consists of three total corn tortillas with your choice of salsa and choice of meat(s) or vegetable(s). Traditionally served with lettuce, sour cream and cheese. One order consists of two hand-made tortilla cakes (a.k.a. 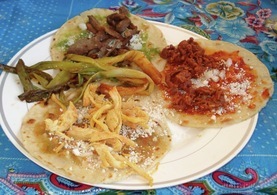 memelas) covered with a layer of refried beans and your choice of meat(s) or vegetable(s). Choice of lettuce, sour cream and cheese. 2. Choose a meat/vegetarian option. 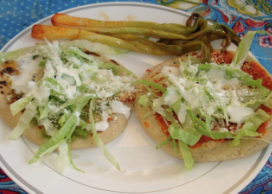 A large hand-made tortilla with a soft layer of beans stuffed inside. Your choice of meat(s) and/or vegetable(s). Topped off with your choice of toppings. A large hand-made tortilla covered with a layer of mozzarella cheese and your choice of meat(s) and/or vegetable(s). Your choice of toppings.